Some more art to share with you today, including two pieces inspired by my long ago, legendary (or is that "infamous"?...) 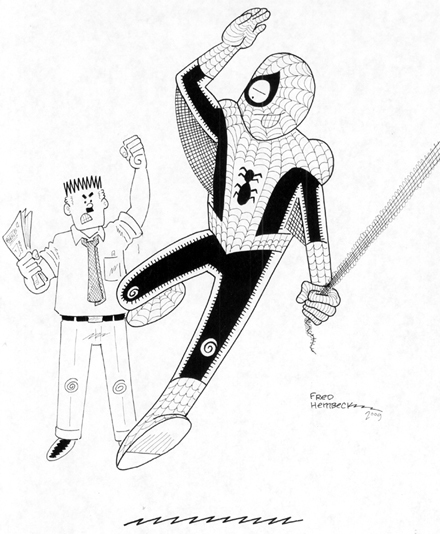 Assistant Editor's Issue of PETER PARKER, THE SPECTACULAR SPIDER-MAN, number 86. Plus, a couple of Yellow Brick Road strollers. 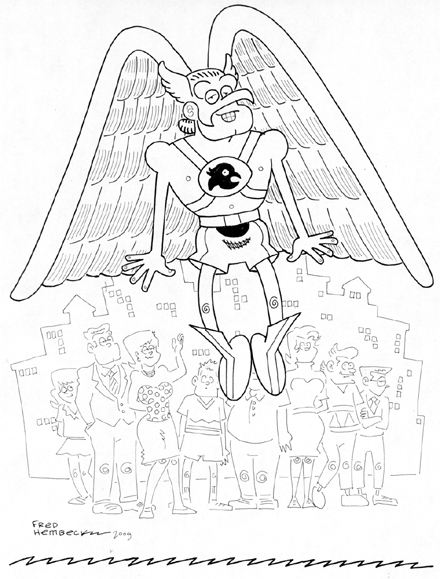 HAWKMAN and a Crowd of Onlookers!! 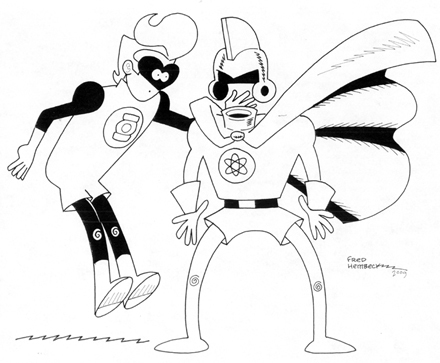 GREEN LANTERN versus The INVISIBLE DESTROYER!! 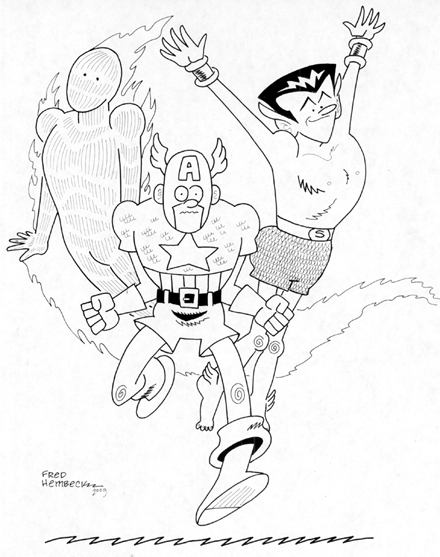 The INVADERS: CAPTAIN AMERICA, The HUMAN TORCH, Prince Namor The SUB-MARINER!! 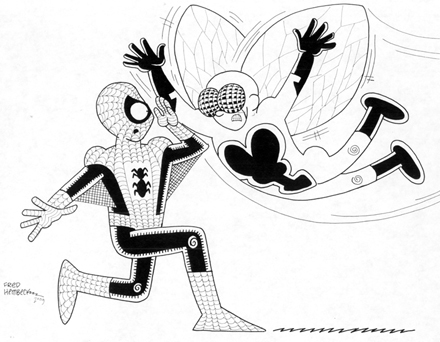 SPIDER-MAN versus The HUMAN FLY!! SPIDER-MAN and The BLACK CAT!! They're Off To See The WIZARD!! As always, click the illos to see 'em larger. And here's the link to our current Ebay auctions. A few words about the current spate of celebrity deaths. 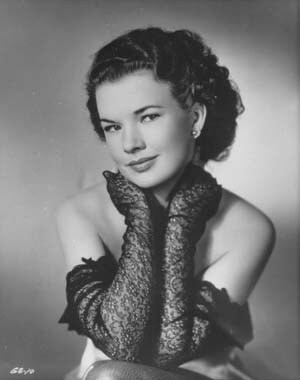 Gale Storm, big-time fifties sit-com star ("My Little Margie", "Oh Susanna") passed away recently at age 87. She had been out of the spotlight for so long--with just a handful of appearances before a camera in the decades after her second show went off the air in 1960, the last being a guest shot on "Murder, She Wrote" back in '89--you might be excused to discover (like I did) that she was still alive. Well, until the other day, anyway. I remember both her shows fondly, watching reruns as a child back in the early sixties. Long off the air, I later caught a few episodes during the eighties, and discovered they didn't hold up very well. Not being one to watch infomercials, I wasn't all that familiar with Billy Mays, but as soon as he appeared as a guest on last Tuesday night's edition of the new "Tonight Show", I nonetheless recognized the voice. Flipping around the tube last night, I see that his infomercials are STILL running--and not, I'm guessing, as part of some tribute. Sad--but I'm still not buying. Fred Travalena, stalwart of the OLD "Tonight Show". Funny guy. Always hurts to lose another Fred. I was never all that big a fan of "The Tonight Show Starring Johnny Carson", but even with only the occasional viewing, there was no avoiding Ed McMahon. When Johnny chose to call it quits and go all hermit-like, Ed did pretty much the opposite. To me, he'll best be remembered as the second in command at the annual MDA Labor Day Telethon for as long back as I can recall. Gonna seem awfully odd to see Jerry up there on his own this coming September--though considering how out of it Ed appeared last time out, maybe that's all for the best. For every "Hi Yo", he got the silver! This may come as a surprise to you folks, but I've NEVER watched a single episode of "Charlie's Angels", and I certainly didn't own that poster. Fact is, I don't think I EVER saw anything--save that infamous "David Letterman" appearance--with Farrah Fawcett in it. No disrespect meant--there's no denying that she was a lovely woman, though her particular beauty was not the type that set my own heart to pitter-pattering--it's just that I was already in my mid-twenties when she hit it big, and since the show was hardly a critic's favorite (and I wasn't watching much TV at the time, anyway), I never did get around to checking it out. But she made a lot of people happy--I'm sorry she had to suffer such a painful end. Which brings us to Michael Jackson. What can I say about him? Well, unlike a lot of younger folks writing tributes on the 'net, I was there when The Jackson Five first broke big on Top Forty radio in 1969. Some of those tunes were just plain wonderful--"I Want You Back", "ABC", "The Love You Save"--and some clearly weren't ("Ben", a love song serenaded to a rat). But after the hits faded in the early seventies, I didn't give the Jacksons another thought for the next decade (somehow, I missed the success of "Off The Wall" entirely, being instead totally consumed with various British New Wave bands at the end of the seventies). That blissful ignorance all changed when "Thriller' came out--and though it was his galvanizing performance of "Billie Jean" on the "Motown 25" TV special that motivated me to go out and actually BUY the LP, most folks forget that the FIRST single released from that album was "The Girl Is Mine", his tepid duet with Paul McCartney--a clever move that, despite the innocuous nature of the tune, managed to gain the attention of plenty of cross-over (i.e., white) listeners, priming them for what was soon to come. Instantly, I became a big Michael Jackson fan. I even went out and bought "Off The Wall" (not unlike as "Revolver" is to "Sgt. Pepper", it's a better record than its more famous follow-up). I played both of 'em constantly. Which wasn't all that long afterwards. Combine the overplay overkill--it was EVERYWHERE--with the emergence the weird details of Jacko's life (that's what they started calling him)--Elephant Man's bones, the chimp, Neverland, Emmanuel Lewis--and by the time "Bad" was released, I didn't wanna know any more. He'd become joke--a creepy, uncomfortable joke, and I stopped being a fan. Years went by. The tabloid stories became more and more outrageous--and eventually, potentially criminal. But when ABC broadcast that infamous documentary a few years back, I couldn't NOT watch--and when he dangled his baby over the balcony, I couldn't not call daughter Julie into the room to show her. To my utter astonishment, she became totally fascinated with the man AND his music! Over the next two plus years, we wound up filling in our MJ CD collection, even acquiring a few bootlegs along the way, with them playing almost constantly somewhere in this house (or more ominously, in the car). I'll admit I gained a new appreciation for Jackson's musical oeurve, while simultaneously tracking his creative decline along the way, as he unwisely continuously attempted to top the untoppable. Meanwhile, my daughter wallowed in his numerous peccadillos, eagerly mocking each and every one of them, thereby demonstrating one of the most peculiar approaches to hero worship I'd ever witnessed. But, knowing Julie, it all made a quirky kind of sense. That fascination began to fade when the first indictment came down, and was totally gone by the time the trial ended. After all, it's sorta tough to be a big fan of an alleged child molester. Some will say, well, he was never convicted of any crime, and while that's true--and I myself reserve a small amount of doubt as to his guilt--some of the things he calmly admitted to regarding his interactions with children were, at best, wildly inappropriate in just about everybody's eyes save his. So, the Jackson CDs once again went into storage, completely unplayed for several years. I watched the news coverage Friday, but tried to avoid the tributes--I wasn't entirely sure, all things considered, that he was worthy. But late the night after he passed away, I came across a video of The Jackson Five singing "I Want You Back" on "American Bandstand", and I just stared at the screen, and thought, "Wow--is THAT cute little kid the same guy who just died?" Unless you knew that he was--and we all did--you'd never have guessed. So I watched some of the videos and listened to some CDs, newly freed from storage, watched some more news reports--until, up on my TV screen, Joe Jackson appeared, being interviewed about his son's untimely death on the red carpet at a BET event by a CNN reporter, blithely using the opportunity to slip in a plug for his new record label!! Unbelievable, absolutely unbelievable. Y'know, I can understand if a victim of abuse is more than a little uncomfortable with these seemingly endless celebrations of the man, and I can also understand how people who grew up with Jackson's music may want to mount those tributes. I can also understand how, folks who could care less one way or the other, might find all this attention afforded MJ more than a little over the top. 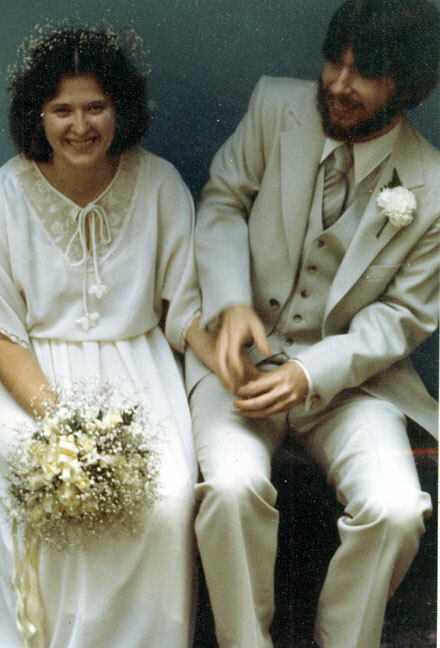 Man oh man, me and Lynn Moss, we sure had us some laughs back then! And y'know, three decades later, we still do! I sure am one lucky fella--and if I can chalk up another three decades of this martial bliss stuff with the missus, well then, I may well be the luckiest one of ALL!! SPIDER-MAN versus The GREEN GOBLIN!! 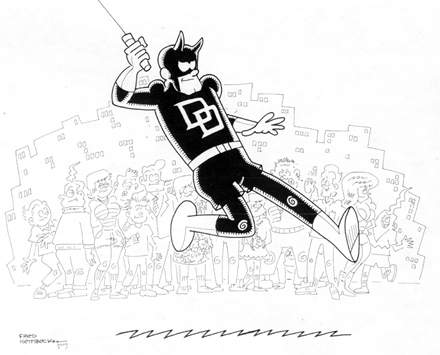 DAREDEVIL swings above the adoring crowds!! As always, click on any of the above illos to see 'em way larger. And here's the link to our current Ebay auctions, should any of you be so inclined!! In celebration of the day at hand, my wife and daughter took me out for a delicious buffet lunch at a local Indian restaurant. Earlier in the day, Lynn had wished me a happy father's day, but inasmuch as our girl had been sleeping over a friend's house last night, arrivng home just before noon, she didn't have a chance to offer up a similar salutation to me before we were sitting down to eats. Midway through the meal, realizing I hadn't yet heard those three special words from the junior member of the Hembeck family, I began to blantantly hint around. "Gee, WHY is it again that we came out today?" I innocently asked. "Because Indian food is good", the little one replied. "Besides that", Lynn chimed in, "isn't there ANOTHER reason?..." My daughter: one of a kind--and now you know WHY!! Haven't been around these parts much lately. Sorry, folks. Guess you can blame some of that on daughter Julie being home and demanding a lot of my time, time I'm happy (mostly) to give. You know what they say about people on their deathbeds--they all wish they'd've spent more time with their families. As of yet, there are no recorded instances of someone's last words being. "I wish I'd blogged more!..." That said, let's just briefly run down some of the things that have occurred in the Hembeck household these last few weeks, shall we? Went to see "I Love You, Man", the funniest film I've seen in a long, long time, and the only one in recent times, aside from "Forgetting Sarah Marshall", that made me laugh out loud consistently throughout (usually, I'm good for a chuckle or two, and some smiles, tops, when I see a comedy). 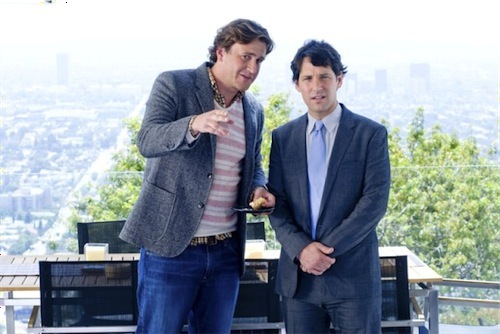 With all due respect to Paul Rudd, I give the lion's share of credit to Jason Segel, Rudd's costar in the former, and the star--and writer--of the latter. The funniest man on screen today, to my way of thinking, and my favorite of all the "Freaks and Geeks" alums. His Lou Ferrigno impression while Rudd's on the phone was merely one of the flick's hilarious highlights!! Spent an afternoon watching nearly two hours of firetrucks from various fire companies, both near and far, parade up a local street in celebration of the 60th anniversary of our local fire department. Went back later that night to watch a great firework's show. Watched this episode of The Outer Limits on YouTube. Martin Landau sure does sell this creaky old sci-fi chestnut--and hey, who knew Shirley Knight was such a cutie back in the day? Did the usual drudge work to get the pool into shape for swimming, and then didn't swim. This has got to be the rainiest, coolest June in recent memory around these parts. You'd think that by June 17th, you could leave your windows open at night. You'd think that, but you'd be wrong. Currently, we're making our way through the first season of "The Office" (American version). I've seen them before, Julie hasn't, but I'm especially enjoying all the deleted scenes that are entirely fresh to me. Then there's Der Bingle. Alan Plessinger pointed me towards this link on YouTube for "The Country Girl", a film which featured an Oscar winning performance from co-star Grace Kelly (and a nom nod to Crosby, who lost out to a fellow named Brando). This was one of those flicks that I'd heard about repeatedly ever since I was a kid, but still knew very little about. Yes, I knew Bing played an alcoholic, yes, I knew hs character was married to Grace Kelly, and yes, I knew about the various Academy Awards it garnered. But I thought it took place in the country, and since it was a drama, that there wasn't any music. Wrong on both counts--Bing plays a washed-up singer getting one last chance to headline a Broadway show thanks to the play's director, William Holden. Man, can Bing ACT!! He really surprised me, effortlessly falling into a haunted gaze whenever the script warranted it--which was often. Conversely, Kelly seems a bit stiff, not nearly as natural as Crosby, and many of the script's attitudes seem outmoded today (particularly Holden's regarding Kelly). The movie is nonetheless engrossing and worth seeing simply for the old crooner's performance. 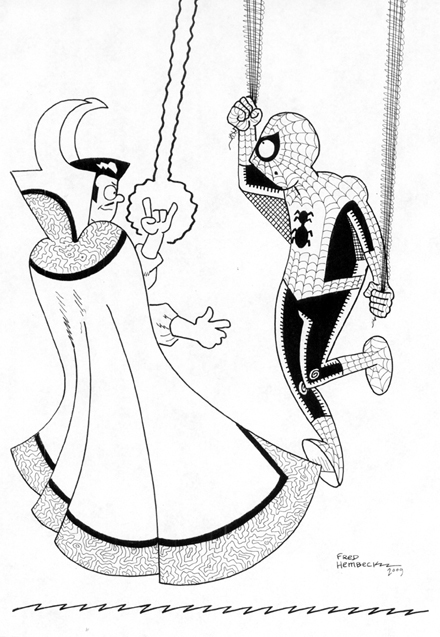 Lastly, I should mention that the 7th issue of AMAZING SPIDER-MAN FAMILY was scheduled to be released to comics stores today, featuring my "Petey" story guest-starring the Drumm Brothers, the eventual Sorcerer Supreme of the Marvel Universe (at least, that's what my spies tell me. I've also heard that Captain America is alive!! ALIVE!! Gosh, whoda thot?...). I certainly hope a few of you pick up the issue and enjoy the story. And it looks as if there'll be another "Petey" episode coming along soon!! Yay! 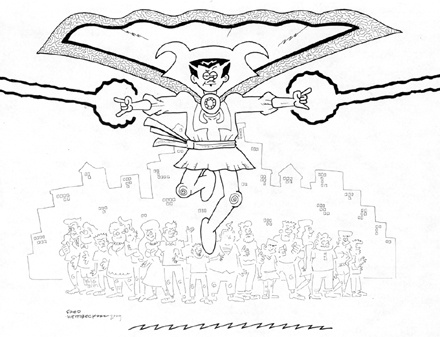 Rob Imes publishes a swell little fanzine entitled Ditkomania devoted to--well, guess! 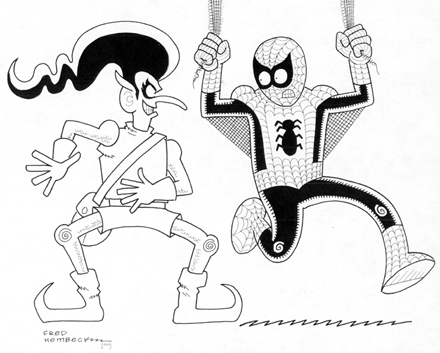 That's right--the ever Sturdy One himself, Steve Ditko!! 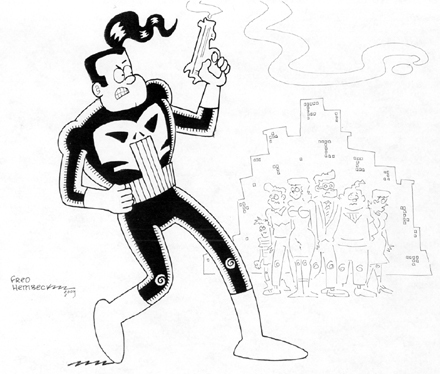 And as I may have mentioned a time or two (thousand...) in the past, the man is my all-time favorite cartoonist. So it wasn't a matter of "if", only "when", for yours truly to contribute a brand spanking new cover illustration to this worthy project. And, um, yeah, that's it above. 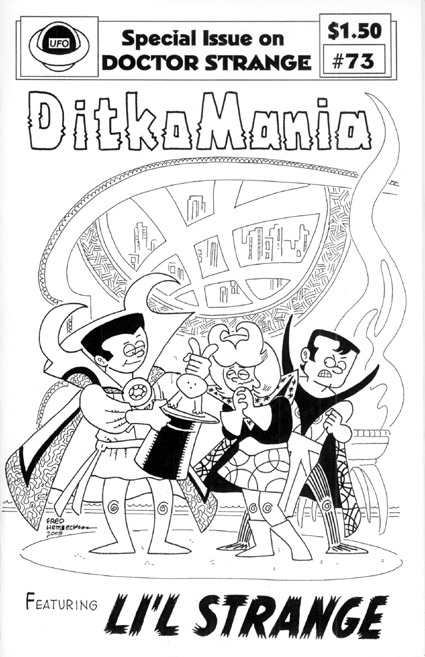 But there's plenty more to this latest hot off the press issue of Ditkomania, and I recommend anyone with even the most casual interest in the artist do themselves a favor and purchase an issue--or better yet, subscribe!! Bucking time-honored fanzine trends, folks, the thing actually DOES come out regularly!! Like Spider-Man, amazing!! But true. All the ordering info you'll need can be found here. Now, proud as I am of MY quaint little cover, you shoulda seen the one gracing the LAST issue!! Whew--hats off to Neil Vokes!! THAT'S one illo that sure does Warren-t praise! 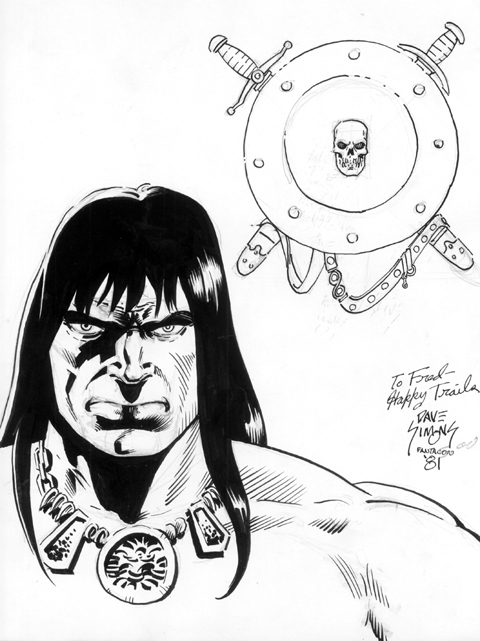 Some more art for most of you simply to look at, and for a few of you to bid on. 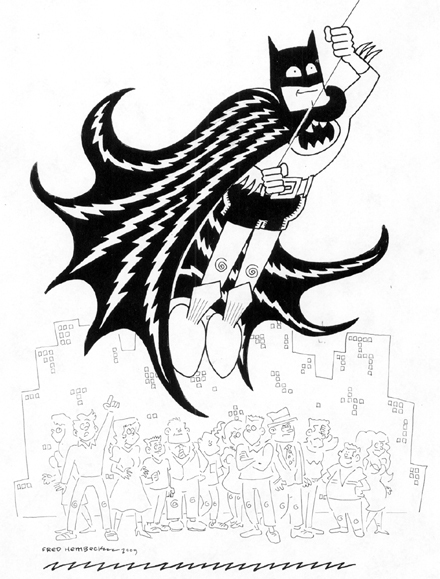 BATMAN swings above the Gotham crowds!! 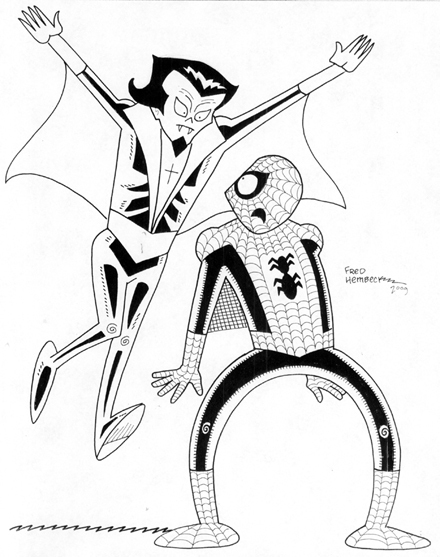 SPIDER-MAN versus MORBIUS, The Living Vampire!!! The PUNISHER and some innocent bystanders!! Click any of the above images to see 'em larger. And here's your direct route to our current Ebay auctions! 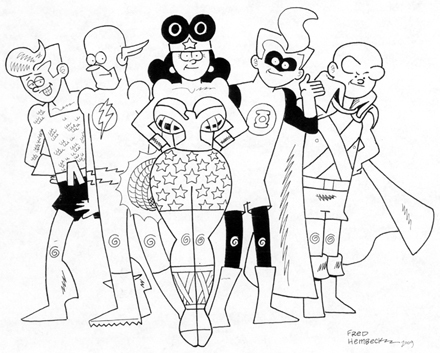 Sad if not totally unexpected news--artist Dave Simons has lost his long battle with cancer and has passed away at the far too young age of 54. 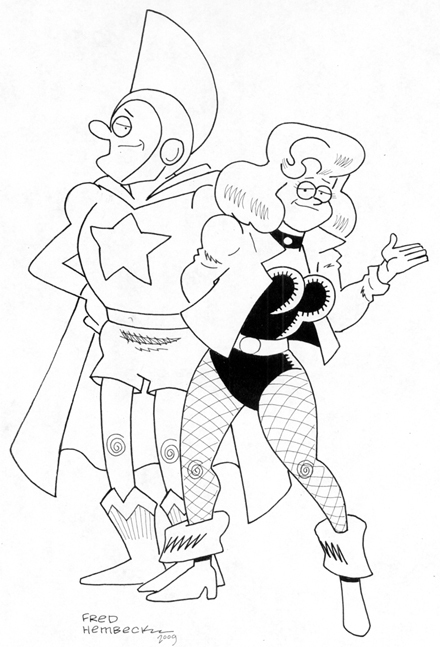 There was a time, way back at the outset of the eighties, when it seemed as if Dave and I ran in to each other at every comics convention we appeared at--and we both did a lot of 'em back then!! He was a very amiable guy, brimming with obvious talent. 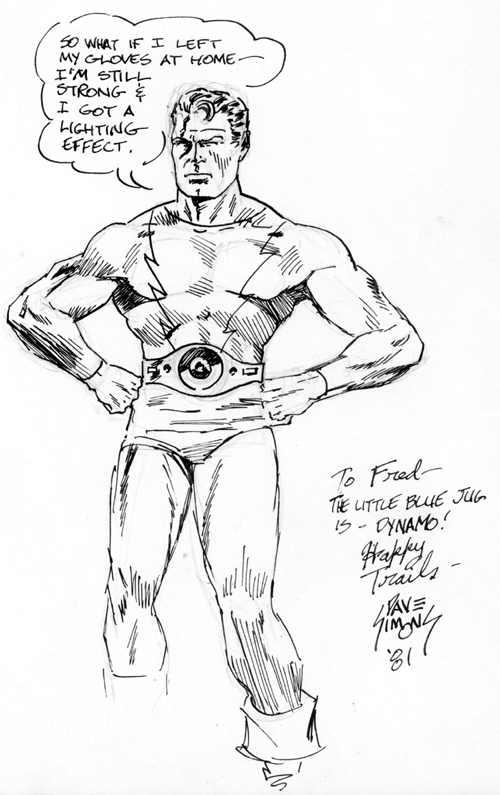 Sure enough, in subsequent years, I marvelled at his ability to so lushly ink (and, in several B&W assignments, expertly tone) the pages of legends like Gene Colan and John Buscema. Dave brought a three dimensional quality to their work that others rarely matched. The guy was good, pure and simple. Truth is, I hadn't seen Dave for several decades before he left us--guess our con schedules got somehow out of sync--but even if he hadn't conjured up this alternative look for yours truly, I'd never forget him. 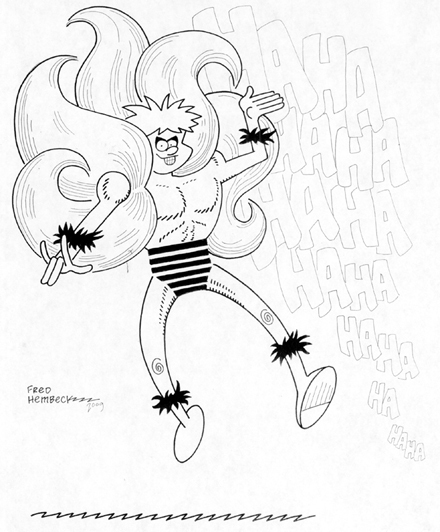 "What if...Fred Hembeck REALLY looked like that?" And down in the right hand corner, Dave personalized it to me, signing it, as always, "Happy trails". Happy trails to you, Dave, happy trails to you. Then there was Facebook. I resisted for a while, but eventually, I was sucked into that as well. Initially, I didn't quite get it, but after deciding to just flat out ignore all the confusing applications--pokes, vampires, gifts, characters, et al--and just use it simply to meet folks, stay in contact, and maybe share an occasional quip or comment, I came to like it, and like it quite a bit. No virtual cobwebs collecting on THAT social networking site in these parts, friends!! (Though, since you need to be a member of Facebook to get into Facebook, I've never quite figured out how to leave an access link hereabouts for the curious, but trust me--I'm there if you want me!!). Which leads us to Twitter. Ah, Twitter. You know Twitter, right? That's the one where your message is limited to 140 paltry characters, and conjures up images of bored celebrities manipulating both of their thumbs while waiting in line, alerting the entire world of their anticipated latte. Not really appealing to yours truly, and again, I resisted. Besides the banal nature of much of the examples I'd seen--plus the notion of limiting me, Mr. Windbag, to one hundred and forty measly characters? Nope, wasn't gonna work, that's what I figured. Still, by now, I knew better than to say never. Because guess what? As of two days ago, I'm Twittering! NO lunch menus, NO quickie TV reviews, NO (choke) Number Two alerts. The reviews you'll find here, the rest I'll mercifully spare you. No, I decided my Tweets (that's what they call 'em; better the double E I suppose than any OTHER vowel movement...) will consist entirely of bad puns and absurd statements, sorta like demented fortune cookies. I'm pretty much set against using it for communication per se, but instead, as an a personal exercise in developing the ability to be terse. Tersely put, to be silly. Who do you think would be more successful? Paul Simon & Jack Kirby, or Joe Simon & Art Garfunkel? Discuss. "Parsley, Sage, Rosemary & ANTI-LIFE." 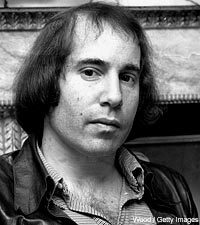 To me, that's just plain hilarious, maybe doubly so because--have you ever actually LISTENED to Paul Simon's lyrics?--the guy is the Darkseid of singer-songwriters!! His tunes seductively soothing melodies do a lot to hide the fact that he's a flat out downer!! Most every song on the first few S&G LPs mention (or implies) death, one way or another!! Truth is, he ain't all that convincing when insisting he's feelin' groovy, but documenting existential loneliness? No contest: Paul Simon's your man!! Blaise Schweitzer, a reporter for the Kingston, New York based Daily Freeman for nearly 22 years, passed away at the all too young age of 44 from colon cancer, which he'd first been diagnosed with back in October of last year. 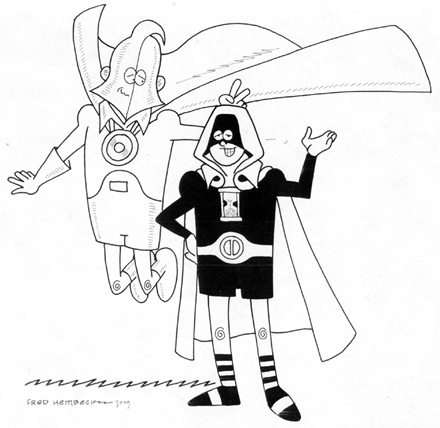 I originally met Blaise through his then colleague at The Freeman, Ron Marz, back when the future Green Lantern scribe brought along his newspaper buddy to one of our weekly volleyball games. It was the late eighties, and each Tuesday, the likes of Jim Starlin, Berni Wrightson, Terry Austin, Joe Chiodo and other locals (both comics folk and non) would gather around the net for a spirited (if sloppy) evening of friendly competition. Tall, good-humored, and eager, having Blaise on your team's side was always a plus. Eventually, for a short period of time, we even carpooled over to the game together, making the twenty minute drive pass by in virtually no time at all. Blaise was a very likable guy, very easy to talk to--traits that no doubt helped him in his day job, but which were a definite plus in his off hours as well. I can't honestly say we were close friends, because we weren't. He drifted away from the game in the early nineties, over a full decade before it would peter out entirely (though his occasional cameo reappearance was always welcomed with great enthusiasm from the rest of us). I think the last time I saw him in person was a few years back at a MoCCA event held at the home of Joe and Hilarie Staton. And then, not long ago, Lynn came across one of the articles Blaise had authored about the bad hand life had unexpectedly dealt him, a series running weekly online at The Freeman. Because Blaise was a newspaperman through and through--what else would you expect him to do but write about his cancer? And being Blaise, HOW would you expect him to write about it but with a keenly wry sense of humor? His weekly dispatches continued almost up until the end--here's the link to his final column (and at the bottom, you can access his earlier entries). The Kingston Freeman's obituary offered up a fine tribute to their long-time employee. And as for that illo up above? 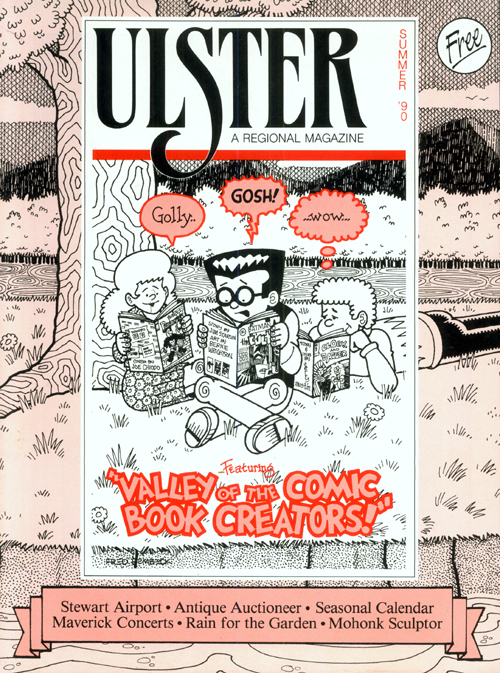 Well, back in 1990, Blaise sold the editor of the local Ulster Magazine on running a story--a COVER story, no less! !--on the ever proliferating crew of cartoonists invading the Mid-Hudson Valley, focusing on yours truly, Terry Austin, and Joe Chiodo in particular (though, ironically, Joe's stay in the area lasted little over a year before fleeing back to the warmer climes of his San Diego home base). For reasons that are no longer clear (but probably having to do with not wanting to alert his editor's to his moonlighting), Blaise had the article published under an assumed name. No matter--I'm betting his bosses knew. His writing was that distinctive. Blaise Schweitzer was a good guy, and in a world that can't afford to lose any more good guys than it has to, losing a real good one like Blaise all too soon is a blow to each and every one of us. 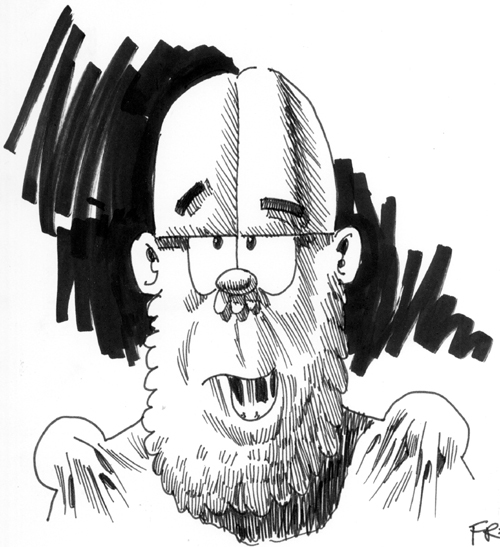 A few months back, I was contacted by a couple of fellows by the names of Ben and Andrew who had the idea to launch a site devoted to tee-shirts utilizing the art of popular cartoonists and illustrators, and--will wonders never cease?--they wanted ME to join 'em? Well, this sorta thing happens more often than you might think to artists with even a modest following like myself--an email comes in out of the blue, all hyped up with grand notions, promising great things for one and all. And usually, after a tentative response on the artist's part (that would be yours truly, folks), little or nothing ever comes of it. But THIS time, things were different. THESE guys were serious. 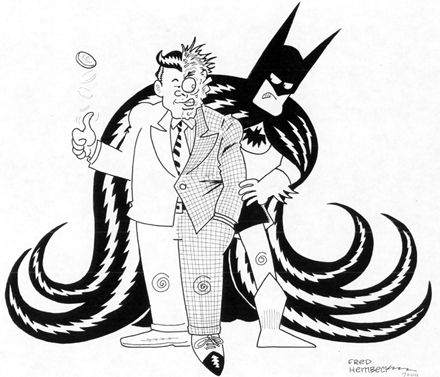 I could tell that from the first time I spoke to Ben on the phone--and I knew it for sure when then sent me a sample of their very first product, an amazingly detailed (and beautifully reproduced) Cerebus tee-shirt, drawn especially for the occasion by creator Dave Sim. THAT'S when I was totally sold!! So I contributed three of my own designs, and did a fourth off of one of their concepts (more on that later), and waited while they secured the work of other artistic luminaries, preparing their site for launch all the while. Well, WORLD OF STRANGE Fantastic Apparel is now up on the 'net and ready for business!! Besides myself and Mr. Sim, they offer shirts featuring both new and classic artwork from over twenty sources, including the likes of Peter Bagge, Bob Burden, William Stout, Michael Whelan, reproductions of some wonderfully lurid paperback cover paintings, just to name a few. 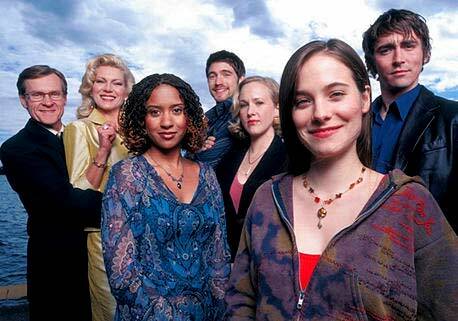 (Go here to see them each at a much larger size). 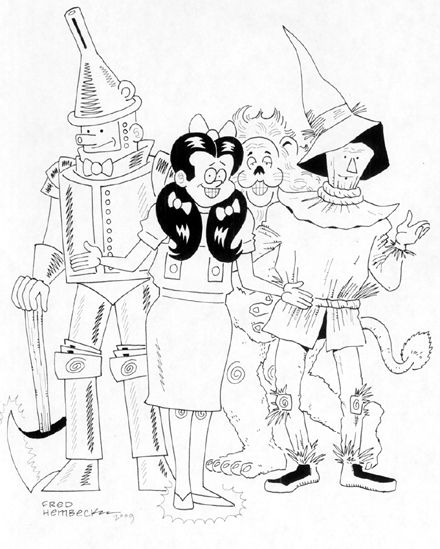 All four are brand new illos, albeit ones based on previously published pics: up top, we have a simplified version of a drawing first seen on this site's Freddy Drew-it page, April 25th 2004 entry (anybody out there remember the Freddy Drew-it page? No? Not surprising... ). Below that is an updated version of the early eighties tee-shirt shown here on a past blog page (scroll down to September 5th to get a better look), with the one underneath that a scaled down (and copyright friendly version) of my HEMBECK OMNIBUS cover. The very last shirt was the brainstorm of Andrew and Ben--it's a play on the Captain Morgan liquor ad, only with a character from "Dune' subbed in for the old pirate. I just did the figure work--Andrew did all the rest, including the coloring and the fancy display lettering. This may well be the first in a series of similar parody tees--only time will tell. And the price for each of these fine garments? A lotta good stuff's available at the WORLD OF STRANGE site folks--I'm naturally a bit partial to my own shirts, but look around. You might find something ELSE you like!! The fellas and myself have some exciting plans for the very near future, and as soon as they come to fruition, I'll be sure to let you know. In the meantime, I've installed a permanent link up top of this blog to allow for continuous access to some of the goofiest shirts ever seen (or sewn!!).. Yup, today's batch of illos all feature characters first visualized by the legendarily Sturdy One! These folks are so awesome, they moved The Fonz himself to utter in amazement, "Aaaayy is aaaay!"! 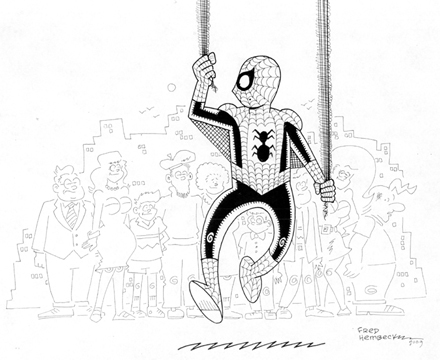 SPIDER-MAN hangs above a crowd of admirers (?)!! Dr. STRANGE floats above a crowd of entranced onlookers!! SPIDER-MAN hangs with Dr. STRANGE!! You may've noticed a group of civilians looking on in the first two pieces--if you want a better peek at these non-costumed extras, all you need do is click the above illos and a larger version will magically appear!! Try it--it's FUN!! And for those folks inclined to purchase any of the above, here's your key to instant access to our current Ebay auctions! !